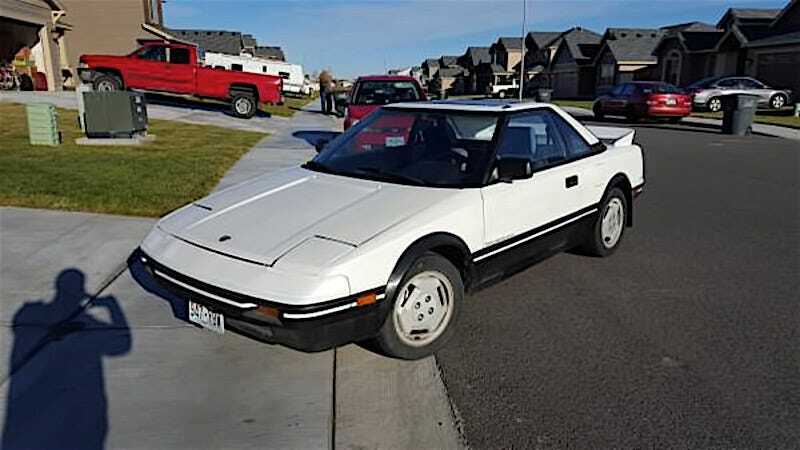 Would You Go $2,900 For This 1986 Toyota MR2 With A Rebuilt Mill? While Toyota’s products are generally considered to be most useful as sleep-aids, there have been ones that might just keep you up all night. Today’s Nice Price or Crack Pipe MR2 is one of those, but will its price require you to sleep on it? Are you familiar with the story about Bertha Benz? She was married to Karl Benz and pretty much saved his nascent auto-making concern by taking a road trip to visit her mother. It was one of the world’s first. As proven by last Friday’s 2006 E55 AMG wagon, a lot has changed since that 1888 pop-in. The E55 may be one the most raucous family haulers in Benz’s storied lineage, but sadly for the seller of Friday’s car, 56% of you felt that mom wouldn’t approve of its asking price. How big is a nuclear family these days? Is it bigger than a coal-powered family? How about one of those wind-powered hippie ones, how big are they? Well, no matter what size, today’s 1986 Toyota MR2 is most likely a car for getting away from the family, seeing as it has only two seats. That’s one for you and one for… oh I don’t know, your gym bag? Hey, sometimes you need some alone time, am I right? We’re all familiar with the first generation MR2, Toyota’s mid-engine wunderkind that took its styling tropes from the Ferrari Mondial and its engine from the Corolla FX16 GT-S. That’s a 16-valve (or 32-valve if you math like this seller) four with 112-bhp and a hot love for the revs. This one’s engine is claimed to be fresher than the prince of Bel Air with only 200 miles on a recent rebuild. Yes, the pic of the engine compartment does not exactly support that claim, but then who are we to judge? Oh yeah, that’s exactly what we’re here for. The rest of the car has 188,000 miles under it’s belt, but it’s still an ‘80s Toyota and those are harder to kill than Adam Sandler’s career. Along with the new motor comes newish paint, the car having been resprayed just three years ago. Since then the lower half has been coated in plastidip because... well, why the hell not? That doesn’t seem to be hiding anything, and in fact this MR2’s body seems to be straighter than most in its price range. The sunroof-topped interior shows its age a little more, both in styling and in condition. The seller rates it a 6 of 10 which if this were Tinder, that would mean a right swipe. The seats at least look to be in pretty good shape. Mechanically, the ad says that the car ‘runs smoothly’ and that the five-speed transmission ‘shifts smoothly with no grinds at all.’ The only add-on apparently is an aftermarket exhaust, and of course that plastidip below the equator. The title is clean and the car has been garage kept all its life. Okay, if that doesn’t pique your interest, then how about the fact that the car can be had with an extra 4AGE 20V Silvertop short block? Yeah, I don’t know if there’s much value in it being a 20V Silvertop if that 20V Silvertop top-end isn’t along for the ride. The seller is asking an additional $200 to clear that boat anchor engine block out of his garage. We’re going to just leave that there and go with the car-only price of $2,900. And now it’s time to decide if that’s a deal or not based on the description in the ad. What do you think, is this MR2 worth $2,900? Or, is that a price that’s a wake up call? H/T to PacNWa for the hookup!